JUNEAU — A U.S. District Court judge has ruled that per-passenger cruise ship fees levied by the City and Borough of Juneau are legal, but they must be spent to the benefit of the ships, not passengers. The decision Thursday by Judge H. Russel Holland in Anchorage may end a 2 1/2-year-old legal dispute between the Cruise Lines International Association and the City and Borough of Juneau, which has spent hundreds of thousands of dollars defending itself in court. The case has significant implications for cities across Alaska that levy their own per-passenger fees in addition to the head tax levied by the state and redistributed to communities. In Juneau, local fees are projected to generate $8.34 million in the current fiscal year. It is not yet clear what impact the decision will have on the city’s finances. “We certainly have lots of things we would like to spend the fees on, and we’re going to be very carefully parsing every word in the 35-page order before we make any decisions on any further expenditure,” Juneau City Manager Rorie Watt said by phone Thursday. John Binkley, president of CLIA’s Alaska chapter, said he hasn’t read the decision yet but has talked with CLIA’s attorneys about it. “We’re pleased with the ruling,” he said from a helicopter en route to Fairbanks. Watt said the Juneau Assembly will meet in executive session Monday to discuss the ruling and whether to pursue the case further. In the meantime, the city will determine how to translate Holland’s ruling into new limits. “We will undoubtedly be talking to CLIA a lot. I would imagine that they are studying every word as well, and I would imagine that we will meet with the CLIA executives and discuss all of this,” Watt said. CLIA did not seek repayment of past fees; both Binkley and Watt called it a “forward-looking” situation. The case hinged on an interpretation of the U.S. Constitution’s tonnage clause, which states in part that “No State shall, without the Consent of Congress, lay any Duty of Tonnage." 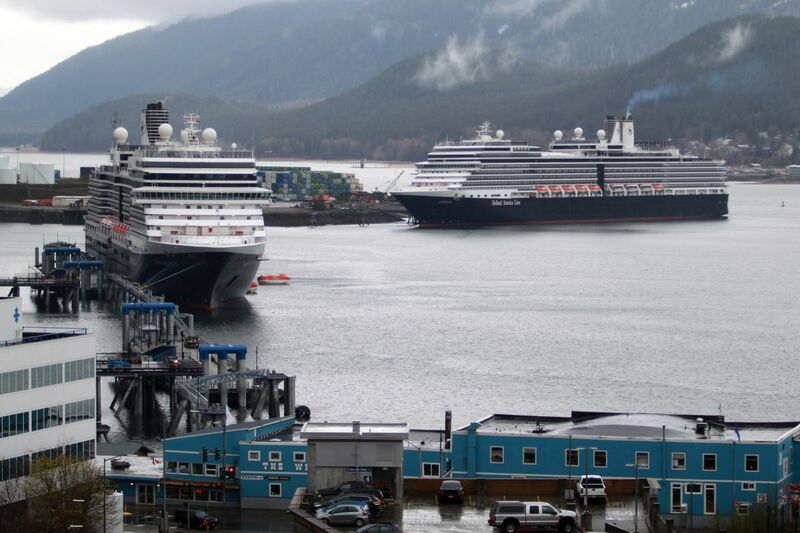 Since 2000, Juneau has charged a fee of $5 per passenger on cruise ships that dock in its ports. Previous examples of how the city has used those funds include increased ambulance service and hospital staffing needed to serve more than 1 million passengers per year, the costs of operating a public restroom, and improvements to city facilities in order to make them aesthetically pleasing to visitors. "And so while we’re not opposed to paying taxes, we feel that proposed island and the foundation for the whale sculpture is beyond what those funds should be used for. We’re just trying to get guidance from the court,” Binkley told public radio station KTOO in 2016. Interpreting the tonnage clause, Holland said the fees must be used to benefit ships, not passengers. “Passenger benefits are not relevant. The proper question as to each category of expenditure by defendants is: Does the expenditure provide a service to a vessel? If the answer is yes, the expenditure is constitutional. If the answer is no, the expenditure is unconstitutional under the Tonnage Clause,” Holland wrote. Both sides sought summary judgment rather than going to trial.